Dementia can be difficult to spot, especially in the early stages. It’s easy for people – including doctors and nurses – to mistake dementia signs for another problem or health condition, or vice versa. There are a number of reasons for this. The main reason is that there are many possible dementia signs and symptoms. Lots of these aren’t specific to dementia, so a doctor can’t diagnose dementia based on a specific symptom. There are also no reliable physical dementia tests, like scans and blood tests, that can confirm a dementia diagnosis. Instead, to start with, the doctor generally has to rely on their observations and the history of someone’s symptoms. It is generally older people who get dementia, which presents another challenge. As we get older, we are at a higher risk of other conditions that can easily be mistaken for dementia, for example, Parkinson’s disease and delirium. Dementia can also exist alongside conditions with similar symptoms. For example, just because someone has dementia, it doesn’t mean they can’t also have a thyroid gland problem. If someone does have dementia and another condition, the other condition might be missed if any symptoms are just attributed to dementia. It’s important for a doctor to accurately and confidently diagnose – or rule out – dementia, for a number of reasons. See our section on Diagnosing dementia for further information. 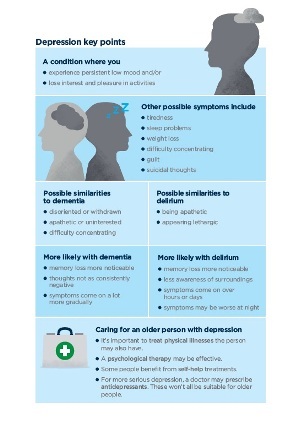 This section outlines some conditions and problems that may be mistaken for dementia and may produce ‘dementia-like symptoms’. There is sometimes a vague distinction between the rarer causes of dementia and other things that may be mistaken for dementia. You may find it helpful to read our section on rarer causes of dementia too. Scroll through the icons at the top of the page to find out more. These are two conditions that can overlap with dementia in quite complicated ways. See our section on ‘The three Ds’ for more information about this. Around half of people with MCI will go on to develop dementia, as symptoms get worse and start to interfere with daily life. But if the doctor diagnoses MCI, they’ll monitor it closely, and suggest activities and lifestyle changes that may have a chance of slowing or preventing the progression to dementia. There are some gland problems that can cause dementia-like symptoms. An underactive thyroid can affect memory, concentration and mood. An overactive thyroid can cause restlessness and anxiety. A range of other conditions, including Cushing’s syndrome, underactive pituitary gland and porphyria may also be confused with dementia. As we get older, our memory naturally starts to get a little worse. But it’s important to distinguish these expected memory problems and dementia symptoms, which are something completely different. See our section on ‘Memory loss and ageing’ for further information. Older people may be at particular risk of adverse reactions to medicines. This is because they’re more likely to be taking more than one at the same time, meaning the medicines may interact with each other. But changes in metabolism as we get older can also increase the chances of medicines causing problems. These interactions may be mistaken for dementia. When doing dementia tests and trying to reach a dementia diagnosis, a doctor will usually look into the medicines that a person is taking. Doctors should also carefully monitor the medicines they prescribe to older people, so that they’re aware of when they’re producing adverse reactions. Vitamin B12 is found in meat, eggs, cheese, and yoghurt. Thiamine is also a vitamin and is found in whole-grain foods, meat, fish, poultry, eggs, milk products, vegetables, nuts and seeds. Both play an important role in the functioning of the nervous system. If someone does not get enough of either of these vitamins, they may experience some symptoms that could be mistaken for dementia. These include confusion, memory loss, difficulty learning new information, and problems with co-ordination, balance and speech. Injury caused by a major blow to the head, or even from repeated smaller blows over a period of time, can cause dementia-like symptoms. These include memory problems and lethargy. Usually, these problems do not get worse over time (unlike dementia). But someone with a long history of blows to the head (eg boxers or other sportspeople) may develop a condition called chronic traumatic encephalopathy (CTE), which does get worse over time. Problems with hearing or sight reduce someone’s ability to take in information, which can make it look like their mental ability is affected. These lists of conditions and problems are not exhaustive. There’s a whole range of things that can occasionally cause dementia-like symptoms for some people and it’s not possible to go into them all here. There is not always a quick answer to the question 'Is it dementia or something else?' But the most important thing is that if someone has dementia-like symptoms, they should see their GP for a full assessment, to work out what the problem is. As we get older, we have a higher risk of getting various health conditions. These include dementia, delirium and depression. These are three separate conditions, but their symptoms and risk factors can overlap. Because of this, it can be easy for relatives, friends and even healthcare professionals to mistake one condition for another. This series of factsheets explains the conditions, some of the similarities and differences between them, and what can help you tell them apart if you’re concerned about a loved one. Click here to view a PDF version of the dementia factsheet (1 MB). Click here to view a PDF version of the depression factsheet (1 MB). 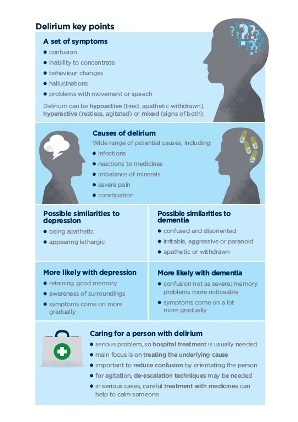 Click here to view a PDF version of the delirium factsheet (1 MB). This information is adapted from an article by Paul Edwards, Head of Research and Practice Development at Bupa UK, originally posted on the Bupa Health Blog. As we get older, our memory naturally starts to get a little worse. We may become slower to learn new information and recall old information. However, this age-related memory loss doesn’t necessarily have a huge impact on someone’s life, provided they’re given enough time to learn and remember things. Rather than one specific condition, the term ‘dementia’ refers to a set of symptoms. This includes memory difficulties, but also involves problems with thinking, reasoning, learning, language, and difficulties with daily activities. There are several different conditions that cause dementia. The most common ones are Alzheimer’s disease, vascular dementia, dementia with Lewy bodies and frontotemporal dementia. For Alzheimer’s disease (which causes around half of all cases of dementia), the characteristic symptom is memory loss. In the early stages of the disease, memory loss is often the first thing that’s noticeable, affecting recent and short-term memories. For example, someone may recall details about their life from many years ago, but not remember what they had for lunch. In vascular dementia (which causes around a quarter of all cases), memory loss is also typical in the earlier stages, though it may not be the symptom that’s noticed first. The main reason is probably because the chances of getting dementia increase the older we get. Between ages 65 and 69, around three in 200 people have it. This rises to around 12 in 200 at ages 75–79, and 40 in 200 at ages 85–89. If you’re worried about a loved one’s memory problems, and you think it could be the early signs of dementia, try and encourage them to visit their GP. They’ll be able to find out a little more, and can refer them to a specialist for assessment if necessary. This will not be an easy conversation to have, especially if your loved one does not recognise their memory difficulties, or does not see them as a big problem. Alzheimer’s Society has some helpful advice about how to approach this discussion. Dementia: supporting people with dementia and their carers in health and social care. National Institute for Health and Care Excellence (NICE). www.nice.org.uk, updated May 2016. Find out about the different types of dementia: what they have in common, and how they affect people differently. An overview of what dementia is, including symptoms, types and who is affected.